We can now use Bitcoins, the world's most popular cryptocurrency, for deposits and withdrawals at WinADay Casino! Bitcoins are easy, safe and quick to use – perfect for online purchases like casino deposits and withdrawals. 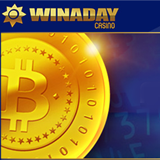 Until Julyl 23rd, WinADay is offering a choice of introductory Bitcoin deposit bonuses. At WinADay, all Bitcoin deposits are converted to USD and automatically added to players’ cash balances. To ensure that the exchange rate is always accurate it’s updated every 15 minutes with the average rate of the three top Bitcoin exchanges. Up to 100% bonus given on Bitcoin casino deposits. Valid for all slots and Keno. Wagering requirement: 23X. May be claimed twice. Valid for all slots, Keno and video poker. Wagering requirement: 17X. To use Bitcoins for casino transactions, players first purchase Bitcoins at one of the many popular Bitcoin exchanges, such as Coinbase. Bitcoins stored there in a wallet can then be used for a casino deposit. Similarly, players can request that their withdrawal is sent to their Bitcoin wallet from which they can then make a cash withdrawal. Bitcoins are already accepted by thousands of online merchants worldwide and there are more and more places to shop using Bitcoins every day. WinADay will soon be adding additional altcoin options for deposits and withdrawals. WinADay Casino, which celebrated its ninth anniversary last month, has 33 unique premium slots. Most are tied to its site-wide progressive jackpot which has just topped $200,000. The unique casino also offers roulette, Keno, 20 penny slots and 10 video poker games, a total of 76 unique real money online casino games.